Many builders work flat out both on the tools, running the job and running the business and at the end of the day, take home an average wage for all the effort and risk. However, the fact that building jobs are high value and high cost offers a great opportunity for smart builders to profit substantially and get off the tools. Too many builders charge their apprentices out at hourly rates that are break-even at best. Contrast this with a law or accounting firm where from day one, graduates are charged out at three times their cost. Even if you think you can’t charge anywhere near that, make sure all your staff are producing a profit for your business. Factor in all extra costs like annual leave, workcover and superannuation. Your value is not just in the work you can do on the tools, but in your project management skills. A lot of builders forget that what they do is also project management and that this should demand a premium and be reflected in a higher hourly rate. Make sure this higher hourly rate is built into your proposals. Work out an hourly rate for overhead costs that your team need to recover. Do this by dividing total overhead costs by total chargeable hours. You might be surprised at the cost, as chargeable hours for your team will be reduced by public holidays, annual leave and ad hoc non-chargeable time. To get off the tools, you will need a subcontractor to replace you. To ensure your project is still profitable, you will more than likely have to put your prices up. This may seem difficult, but the good thing about building is that you don’t need to increase your prices by a huge percentage to cover your project management fees. For example, let’s say you quote a job at $500k. Currently, you work on the tools and do two of these jobs each year. You want to get off the tools and move to project managing. If you do this, you could do four projects a year rather than two. To pay yourself an $80k gross salary, you will need to increase the quote of each job by $20k, or 4%. This is not a huge increase and can be sold on the basis that a dedicated project manager will be allocated to the job, rather than a builder on the tools trying to manage everything at the same time. Your hours and cost as a project manager also need to be factored in. Labour time spent on the project, labour productivity percentage and materials costs are the numbers that will determine profitability. Ensure you know how much time should be spent on each part of the job and importantly, how much time has been spent. Make your team aware of this, publish a ‘visible scoreboard’ and reward your staff for finishing the job on time. Profit First means you have a system for paying your profits before anything else. 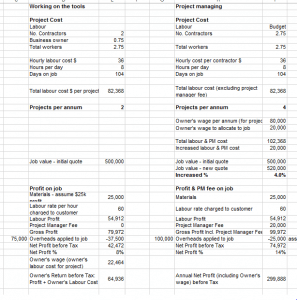 Work out the profit you should be making on the job and ensure the calculated amount is transferred to a separate account, as discussed further below. This discipline will help ensure costs don’t blow out and ensure profit you have forecast ends up becoming a reality. It will also provide a warning system if you are unable to do this due to unexpected costs. Ensure you have a separate bank accounts for profit with funds directed to it with every progress payment received. This bank account should be with a separate bank to your normal bank and accessed after each quarter, to either pay off debt or pay yourself a dividend. The $130k to $300k is a real life example! The $130k to $300k comes from a real life consulting and financial modelling exercise and the owner is currently carrying out everything we’ve discussed. See below for a copy of what the spreadsheet looks like. If you want a copy of the financial model or want to chat about improving profits in your business, give me a call on 0447 407 576 or email angus@morrisonabs.com.au or book a 30 minute initial consultation at http://bit.ly/2M6893p, I’d love to hear from you.